Properties in Ionian Islands Region average 4.7 out of 5 stars. Delightful Holiday Cottage Finished To A Very High Standard. Property 5: Delightful Holiday Cottage Finished To A Very High Standard. Voro Cottage, Lithakia Village, private plunge pool and panoramic sea views. Property 22: Voro Cottage, Lithakia Village, private plunge pool and panoramic sea views. Odysseas Bungalow-Relax And Enjoy The View Of The Endless Sea From Your Balcony. Property 33: Odysseas Bungalow-Relax And Enjoy The View Of The Endless Sea From Your Balcony. Book & Safe: lovely 2 bedroom cottage by the sea.Discount for early booking! Property 38: Book & Safe: lovely 2 bedroom cottage by the sea.Discount for early booking! Relaxed holidays a few steps away from the sea and with a sense of privacy. Property 40: Relaxed holidays a few steps away from the sea and with a sense of privacy. Penelope Bungalow will give you the exceptional summer relish. Property 47: Penelope Bungalow will give you the exceptional summer relish. Very special place, if you want a place to truly be away from it all on Corfu.....this is it. The cottage is in a perfect position as is just set back off the main street,so secluded if you like peace and quiet.The wonderful beach is only 5mins walk.Local restaurants.on the main street and the beach are al good,but like other places we had our favourites...likeThalassa...Theodoros...ark bar...alexis...dionisos...romantic palace..etc...You have use of a swimming pool opposite the entrance to the cottage,which is excellent,you only have to buy your refreshment there. 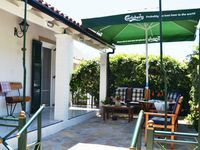 The cottage itself has 2 large bedrooms,a small kitchen diner but adequate,bathroom and shower.Outside area is great,plenty of room for seating,sunbeds,outside dining area and barbecue. Last but not least is the owner Nicoletta,from the moment you arrive to when you leave.nothing is to much trouble for her,any problems you have will be sorted quickly or she will get back to you with solution.The cottage is clean,well maintained all down to her enthusiasm to make her guests feel like being at home.We have no hesitation in highly recommending this cottage for a holiday in Agios Gordis.